So it turns out that Marié’s friend had introduced her to Seto-san, who is both the clarinetist for Freylekh and the band leader, and Marié was staying with Seto-san and his family for a few days while doing research. 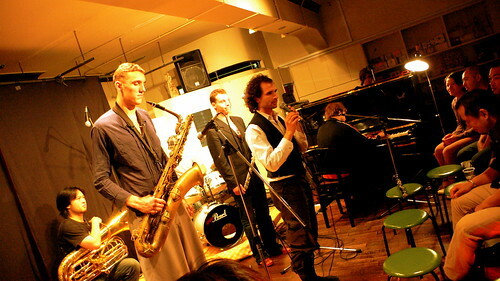 And Freylekh just happened to be having a show at Osaka’s Fiddle Club with Black Light Orchestra and the Septembrists. And did I want to go? I’d seen Freylekh play once before at Rain Dogs, and their set just blew me away. 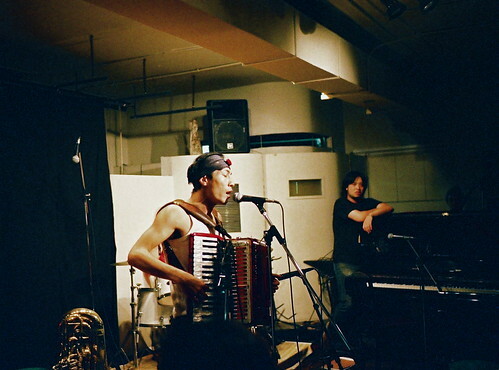 Freylekh is one of the tightest, most exciting klezmer bands that I’ve ever seen. And their show at the Fiddle Club was no exception — awesome syncopation, manic tempo changes, and some from-the-gut klezmer deep grip feeling. For me, listening to good klezmer is always a kind of tightrope walk between the feeling of deep-rooted sadness it generates at one level, and the feeling of hilarious anti-gravity that rides above it all. Freylekh puts all of this right on the plate so you can eat-it-up-delicious. 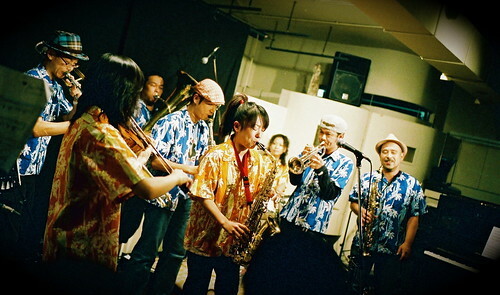 And they have a new CD out too — Nippon Klezmer. It’s great, and has wonderful cover art illustrating the legend of Momotaro. Seto-san is also plays clarinet in a chindon band, though I can’t remember the name right now (maybe it’s Chindon Tsushina). 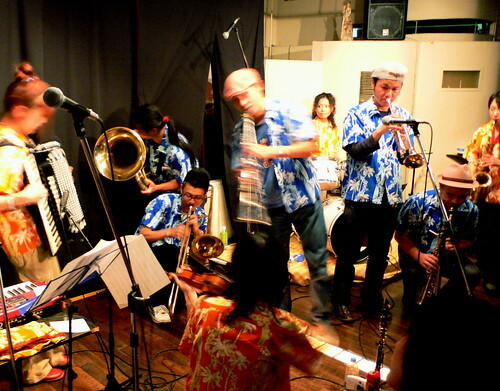 Apparently, however, they play every summer at a shrine in Okamachi and I really hope to be able to catch them next time. Click here for the Freylekh Jamboree homepage. Click here for the Fiddle Club homepage. Link to Cicala Mvta homepage. Link to Soul Flower Mononoke Summit page. Link to Chindon Tsushinsha page. Freylekh gets down. Getting down also included a chair-walk through the crowd by Seto-san, the trumpet player (also Seto-san! ), and the saxophonist. The finalé of the Freylekh set was something special and riotous with all the members of all three groups joining in. Which meant three drummers, two accordionists, an expanded winds section, and two tubas. Including — Yes! — a dueling tubas faceoff. Last living survivor of the great scottish-jewish music-hall tradition, mr Diagonal invites us into his private universe for an enchanted evening of after-dinner rock ‘n’roll. We find ourselves on a personal visit of his museum of the impossible, to a soundtrack shot through with english pop, galactic glam rock and geriatric nursery rhymes, here accompanied by The Black Light Orchestra, Belgium’s premier pocket surrealist pop ensemble. A show for all lovers of ahistorical costume drama, british humour and inclassable music, and for all who have ever known and loved Mr Jack, Mr Ben and Mr Bean. An exquisitely relaxing evening of preposterous pop. This seems like an accurate description to me and I enjoyed my evening of preposterous pop immensely. Click here for the Black Light Orchestra homepage. The Septembrists were a trio of drums, keyboards, and accordion. The singer, Matthew, sang in a beautiful falsetto. I’m not sure what you would call the music they played — perhaps a kind of nouveau chanson? French café music for the moderns? In any case it was beautiful and delightful. The Septembrists, who change their name each time the month changes, also had wonderful CDs for sale — each CD with an individual hand-drawn cover and a slit so you can see through to the CD below, which has the names of all the months written on it. Turn the CD and the proper month appears in the viewfinder so you can be sure you know exactly which month it is that you’re listening to.